Hello! 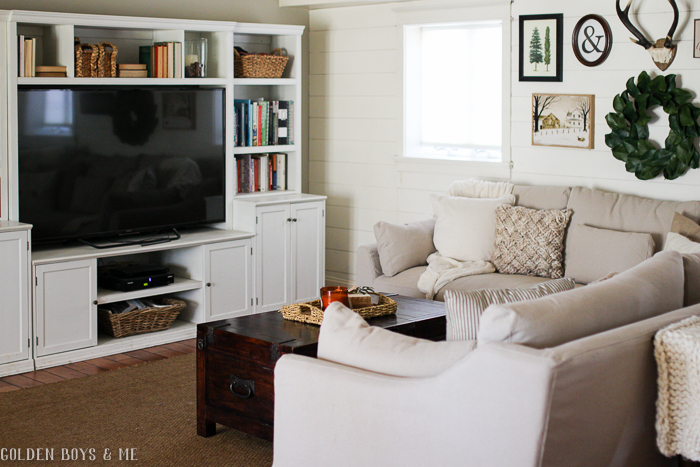 Today I am finally sharing some pictures of our updated family room. Winter has definitely overstayed its welcome here in NJ and we are expecting even more snow this week despite the official start of Spring on the calendar. 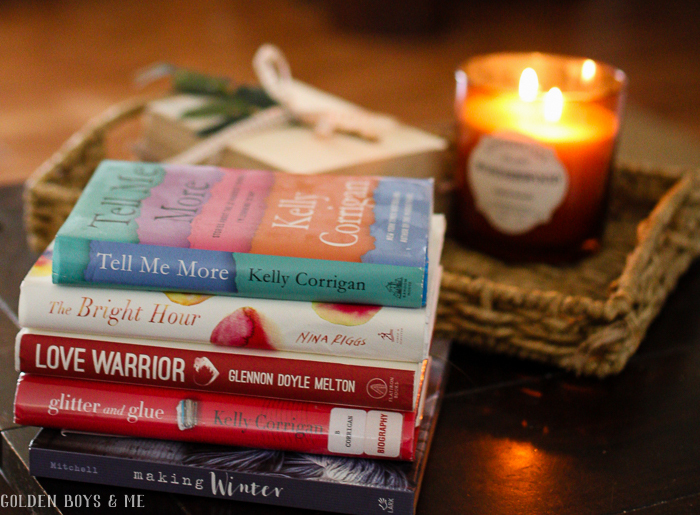 I have been trying to combat that by embracing the cozy and making use of this quieter season to read and slow down. 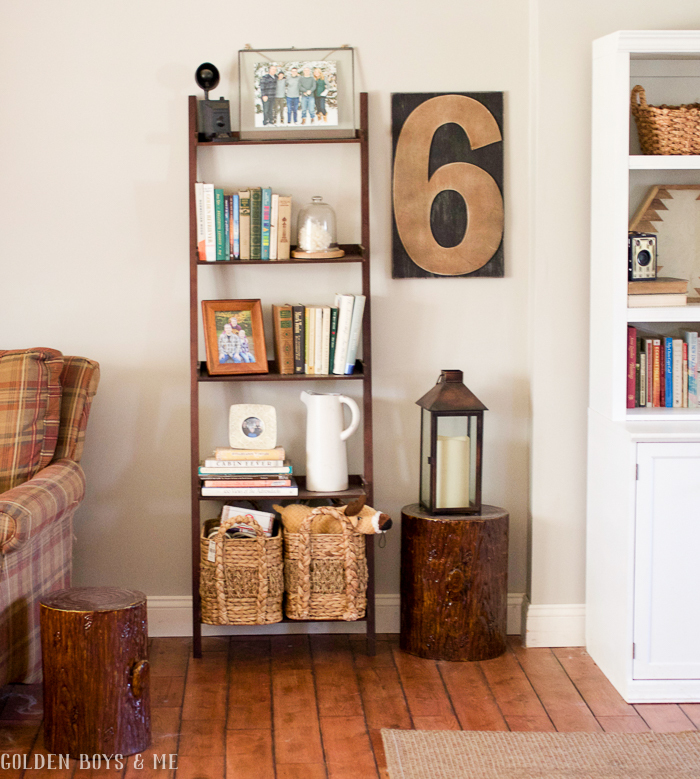 We did a complete a couple of small projects in the family room recently. The walls were in desperate need of an update so we painted them, using Behr paint in the color Sculpted Clay. 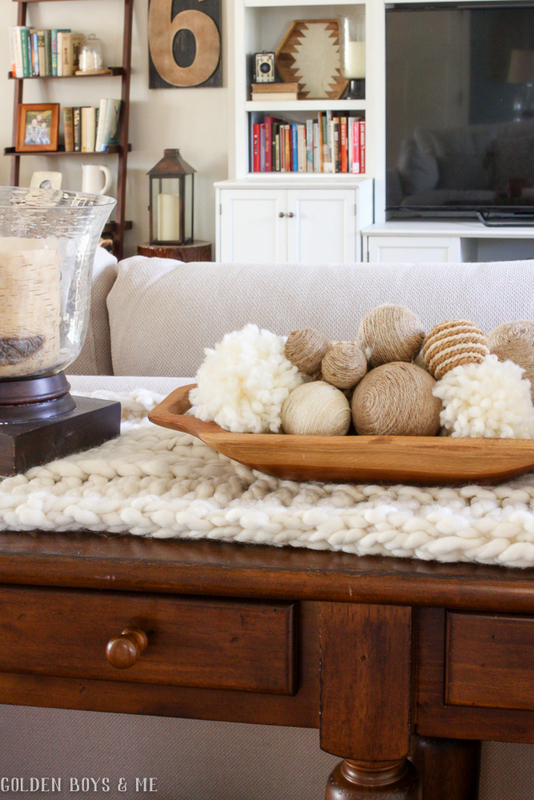 It's a beautiful fresh and neutral color and makes the space feel cleaner and brighter. We also added the new sectional that I talked about in this post. 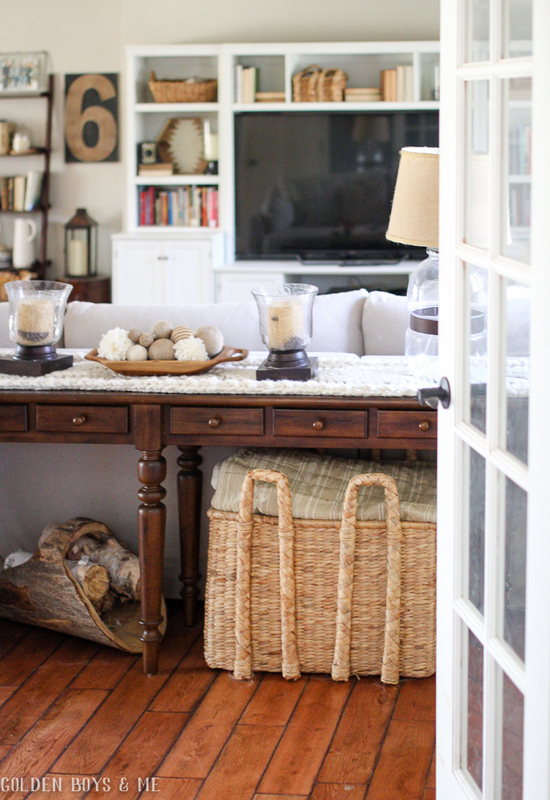 The seat is the perfect depth for nap taking, tv binging and reading. Speaking of television, I finally watched The Handmaid's Tale this winter and it was definitely worthy of all the hype. I am currently in the middle of an older TV series - Everwood - and enjoying it. I have a stack of fiction waiting for me on my bedside table, but it seems I kept reaching for non-fiction this winter. I guess you could I say I am digging deeper for more meaning this season. Just a few months into 2018, we have witnessed close friends deal with death too soon and devastating illness. Tell Me More by Kelly Corrigan, a sort of manual for maintaining meaningful relationships in our lives, was thought-provoking and funny. I can totally relate to her struggles and pure joy at raising teenagers. Have you seen this video of hers? Which lead me back to Glitter and Glue, one of her previous works that I somehow missed. The Bright Hour by Nina Riggs was a more difficult read because of the subject matter - death and living. 38 years old and a mother of 2 young boys, Nina writes about the end of her life in such a relatable and profound way. It's a reminder to enjoy the everyday like no other. That this it - this is the great adventure. Can't we all use that? That book will certainly stay with me for a long time and I highly recommend it. Looks so warm and inviting Courtney. While involved in two Bible studies this year, I haven't gotten much other reading in. I have several books just waiting to be read, fiction and non-fiction alike. I have not read any of Kelly Corrigan's books, but know many who have and enjoyed them. So sorry to hear what your friends have gone through. I just listened to Kelly Corrigan’s audio book, which she read; a few weeks ago. It is a profoundly moving book that helps you realize that family is what it is all about! After growing up during the feminist era, it is wonderful to see that we have come full circle. I love your new paint color and your new sectional! I can just see your whole family cozied up and watching TV, with room for the dogs! I hope your winter ends soon. Enough is enough! I'm glad I'm not the only one feeling the trapped gloom of winter in NJ. Ugh! I'm so ready to get into the garden. I actually bought some cute topiary twists and I'm going to make an attempt at training some English ivy up them. Even more than my passion for home decor, I'm an avid gardener. I just can't wait to play in the dirt. lol. 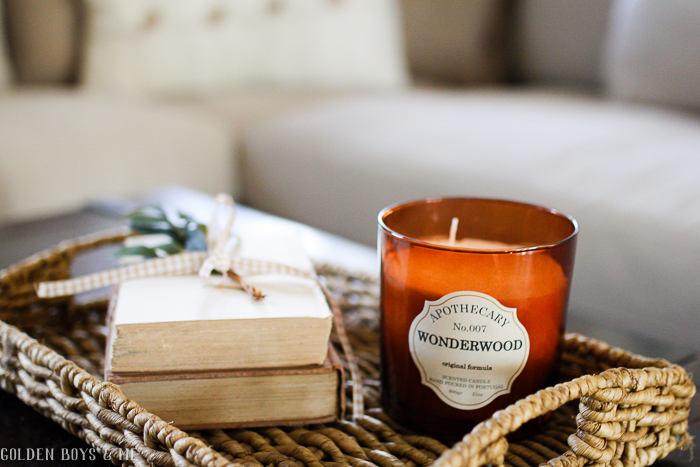 Love seeing your cozy home, and glad to see you are enjoying and relaxing! Good morning sweet friend. I love love the wall color. Very warm and pretty. Your new sectional looks very cozy to snuggle up on and watch a great TV show or movie. I have not heard of Kelly Corrigan but these sound like good reads. I will have to see if they have these at the library. Have a great new week. 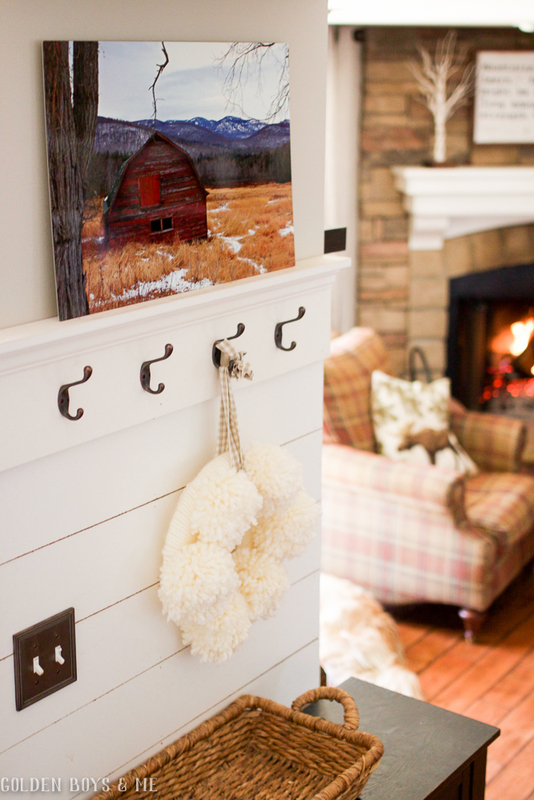 This This room is so cozy that just looking at it makes me feel relaxed!!! 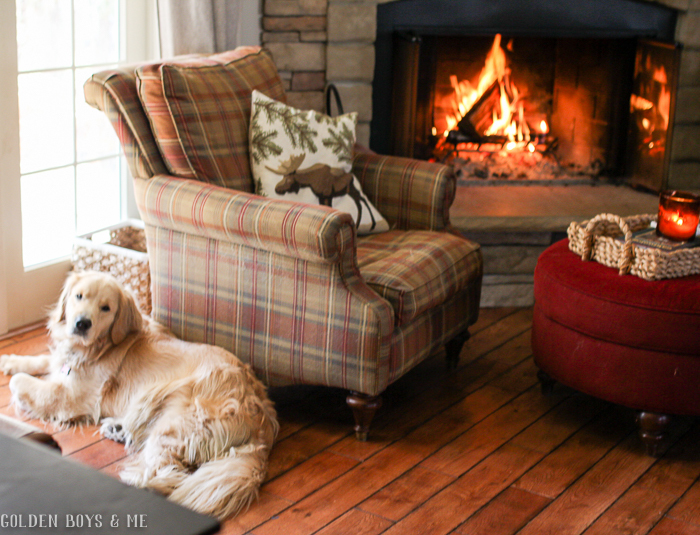 I live in Southern Massachusetts, so I know how you're feeling about the weather, but after seeing you're family room I have a little less anxiety about this next snowstorm...this post actually makes me want to snuggle in with a good book, the way I feel before the first snowstorm of the season! 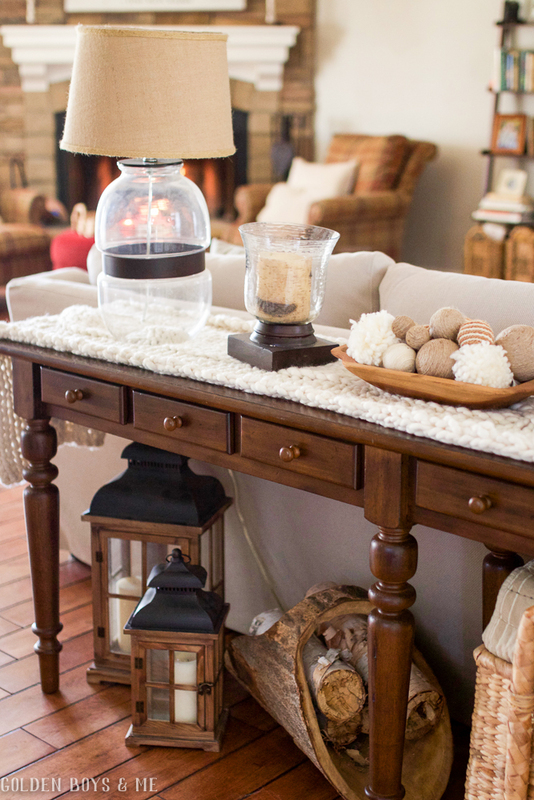 I always look forward to seeing the changes you make in this beautiful room! It looks especially cozy today with this next snowstorm beginning...ugh. As you may have noticed, we are in the 12-18 inch range. Time to curl up with a good book. Thanks for the recommendations. I am intrigued by the Bright Hour. Although it might be difficult to read, it also sounds inspiring as well! I just finished Leah Remini's book, Troublemaker. I knew it would be interesting to hear her thoughts on Scientology but - wow! I definitely recommend it! 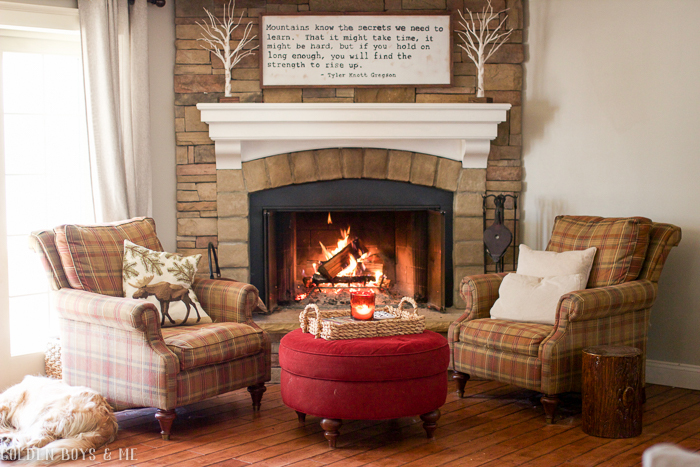 Stay warm and cozy with your sweet family in that beautiful room today! Let's hope none of us lose power! Thanks for sharing your lovely house it just looks so warm and inviting. Interesting that you have that Kelly Corrigan book. I recently saw her speak about that book at a book store. She was funny and touching. I ended up buying the book. If I'm honest I really went to see Matt Nathanson who played some songs in between her talking about different parts of her book. But I am glad to have seen her and enjoyed hearing her. I just need to pick up that book now. Hi there, it is really very touching story... By the way, your experience helped me to create the best design ever! Thank you so much.